Paw Province: Notice The New Tab? I'm sure you've noticed the tabs at the top of the page. You can learn more about my blog, me, my pets, read some stories I've written, and some other things. Last weekend I added a new tab about Junior showmanship. If you'd like to learn more about handling dogs, especially if you are 9-18 years old (the Junior age range) I definitely recommend that you check out the tab! You can also hear about the dog shows I have competed in. Because I didn't want to leave a post without a picture, here is a photo from the Atlanta Kennel Club Dog Show in October. Chris went Reserve in breed, meaning he was the second best smooth Dachshund at the entire show! 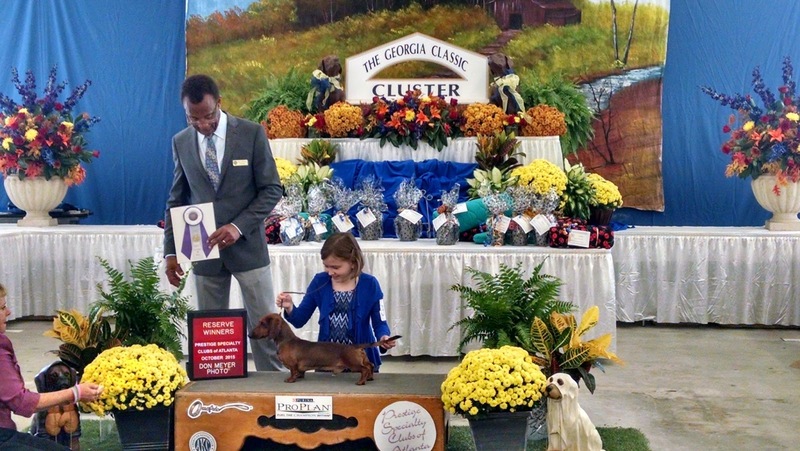 My doxie boy looks quite handsome here, and the judge is holding the ribbon we won. Have a great day and be sure to check out the tab! That is a nice picture of you two (and the judge). Thanks! It is my favorite picture from any of the shows I've been to. Congratulations on your win! Did you see any cocker spaniels there? Yes, actually, quite a few! They are usually a common breed at shows (I'm referring to the American cockers) and though I didn't see any in Clemson (what's up with that?) I see a good handful at most shows. I love their small heads, beautiful feathered coats and ears, and of course their almond eyes. They are always as sweet as can be!